As part of the temple hopping and the 20 Baht tuktuk ride, we had to visit Baan Thai Jewelry shop and a tailor shop concealed as a silk factory, who subsidize the trip by giving petrol voucher to the tuktuk in exchange of bringing them tourists who will be converted into customers. These places are like a bait or a spiders web. Once you step inside their doors, you will be lucky to come out with your purse unscathed. As an agreement between you and the tuktuk driver, you will have to stay inside (read look around) for at least 10 minutes. As soon as you enter, highly trained salespersons greet you and build a rapport by asking where you come from. I always told them I came from the Philippines, but Alex couldnt deny her origin of continent at least. Sales people are good psychologists and as a precaution, never show interest even if you are. Having been in that industry for years, those salespersons have mastered the art of converting a tourist into a customer. Just a little lit up of the eyes or a slight smile when you see something that interests you is carefully watched and they can begin to craft sales tactic that often times could be pushy. You have to get one step ahead of them. I had to learn it the hard way. I guess that is the case with most people. At the tailor shop, I made the mistake of accepting their offer to show me a catalogue. I just wanted to find out how much a coat would cost. Wrong move! A simple coat was 5,000 Baht. Thats almost £100! Then I made another mistake. I looked for another style, a suit this time, and it was priced at a whooping 15,000 Baht. Thats roughly £300! Now, two people were pressing on me and I started to feel uneasy. If you think that was cheap, then be their guest. 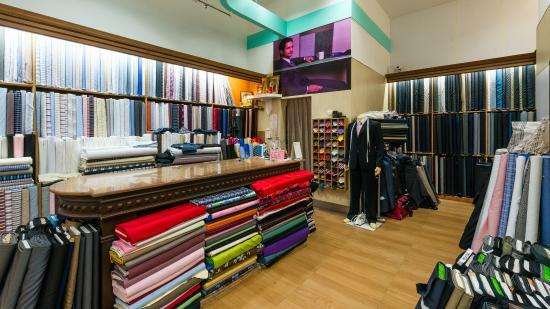 You can go to a local tailor who will do the job for you for a fraction of that price. These shops are hiring tailors who get only a small profit and the shop owner gets the lion share. Im not buying that. Alex whispered and asked me, How do we go out? Now I had to devise a tactical exit. First I made excuses. Im flying tomorrow at 5AM. It didnt bode well. Well have it delivered to your hotel before 8pm tonight came their quick reply. Finally, I said, I dont want to be pressured! Thats the keyword! The lady changed her tone and said, Just say No. We dont want to pressure you! But before letting us off her claws she tried her last Hoorah. Im not pressuring you but if you buy it today, Ill give you another 1500 baht discount. BUT only today! This time Alex and I graciously refused and walked out as fast as our feet could take us. Rule #2: Dont be afraid to firmly say NO! Remember, you didnt choose to go in. You didnt want to be there. So stick to that fact and stand up for yourself. If they come and offer to assist you, just say, Im just looking and quickly walk away. Sounds like great advice for any high pressure sales place. I live in India so this happens here ALL the time. Kind of immune to the hustling now. Great tips though for tourists who tend to get ripped off at times. 🙂 After living in Angola for 3 years, I would definitely not have a problem with this! When I see someone approaching in the streets Im already saying no thank you. Hahah! You can detect them from a mile off eh? I saw your post about the Desert Tour and Id like to do it as well. Haha, thanks for this! This routine gets so annoying after a while and Im so bad at being assertive! Love this post, such a common problem in almost any asian or even non western country. I always find it super hard to say no because most people are really nice, especially in smaller towns!